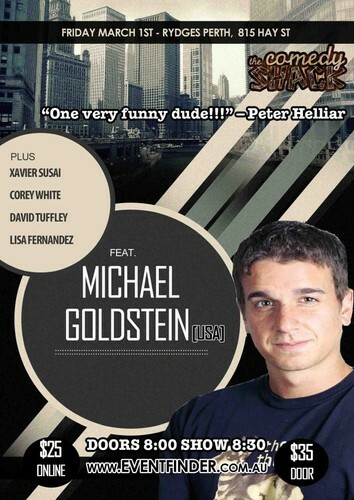 We are back with another fantastic show featuring the constantly touring and comic that gigs with the best in the country Michael Goldstein. Supporting Mike are some very talented people who have been making people laugh around the country and locally for years they're hilarious and just can't wait to perform for you. Come down early and enjoy a fantastic meal and drinks in the CBD Bar Restaurant located in the Rydges a fantastic menu full of tasty morsels and refreshing delicious drinks. So bring your work mates, friends and family and make a night of it and join us for what will be a huge night of live entertainment that will have you talking about it for the rest of the week.